d. been an ex boyfriend/girlfriend, friend, etc. 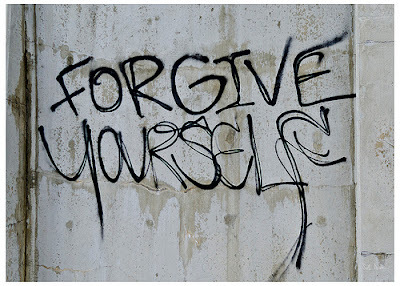 e. anything you can come up with or recall about a person you have yet been unable to forgive. If you wish to read a more detailed description go directly to today's task of the 14-Day Kindness Challenge at PersonalExcellence.co. Personally, I found today's task to be hard. So much it's taken me a long time to achieve this task. Why? Because sometimes the inner thorns are deep and hard to detach but it's only if we remove each thorn that comfort can be found. There's another reason as well-- in my current state I can be a hot-tempered person sometimes because I'm hiding my own insecurities and thus I don't share my emotions as much. But as the quote on my image suggests...it's the people who can't forgive that are the weakest and the people that do forgive the strongest. Sometimes we can make a million excuses as to not forgive someone..and it's probably one of the hardest things to do in certain situations but saying an "I'm sorry" and an "I forgive you" is more than just a treasure. it's a lifestyle and a liberating process. I was able to forgive 9 people today. I forgave them because I realized that the reason I was mad at them was not because they had wronged me...it was only because of my lack of understanding for others needs at times and my own selfishness led to me blaming them when in reality..the person who I most couldn't forgive was myself. I was frustrated at my own failures and when I saw my failures mirrored in another person I couldn't help but feel a restraint and like second nature become cold and mean when all that was happening was that I felt unsatisfied in myself. I wasn't satisfied in myself. I was holding on to expectations. "Who I am to be angry at somebody else, when I'm not feeling what they are going through." In some way, this is true. Even if it's somebody close to you and you think you can understand what they feel--the truth is we can't 100% understand and live in the flesh what others are doing, what problems come up in their daily lives, what stresses, what feelings their lives events trigger in their hearts, etc. Forgiving is a process and a lifestyle. Sometimes it takes a while to truly forgive..but it's possible..and it's worth it..